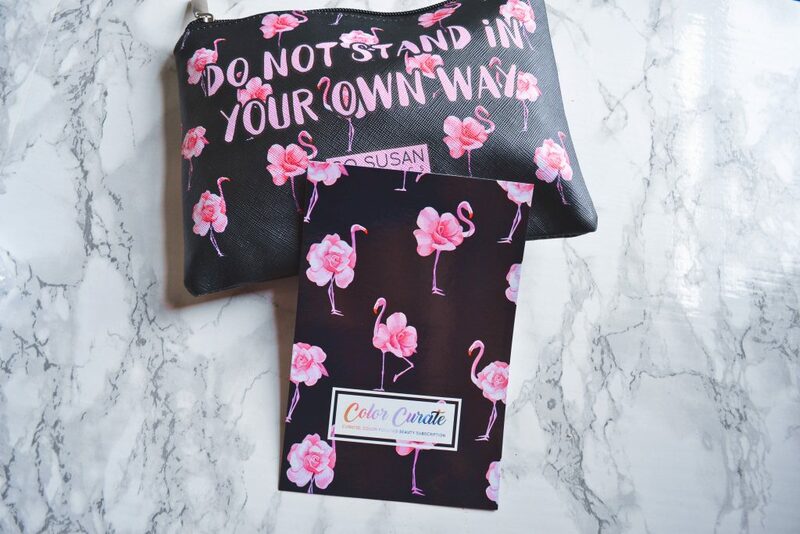 I really love the makeup bags I receive with my Color Curate! They are durable, and always have such trendy designs. 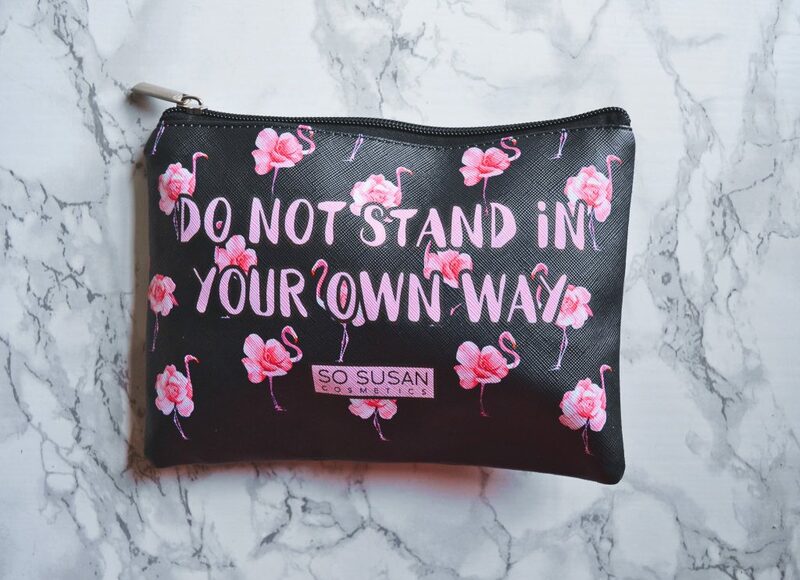 I used to have a surplus of bags from another subscription, but I’ve found that these can hold more makeup and the material keeps them from looking dingy after some time in my makeup drawer. This month’s bag is covered in little flamingo/flower hybrids! I actually didn’t realize they had flower bodies until my third or fourth time looking at the bag. 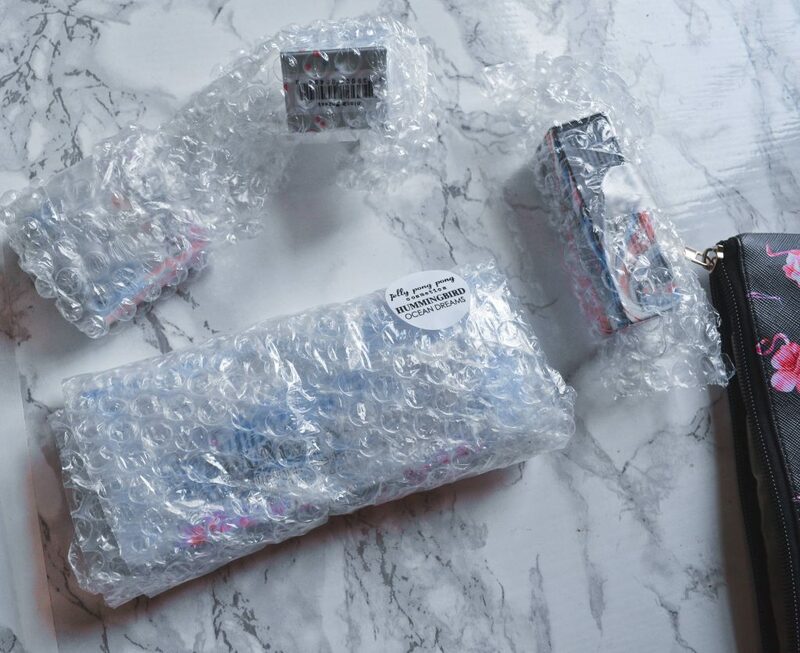 Each item was securely packaged in bubble wrap, and arrived in perfect condition. Here’s a look at every item I received in September’s Color Curate. 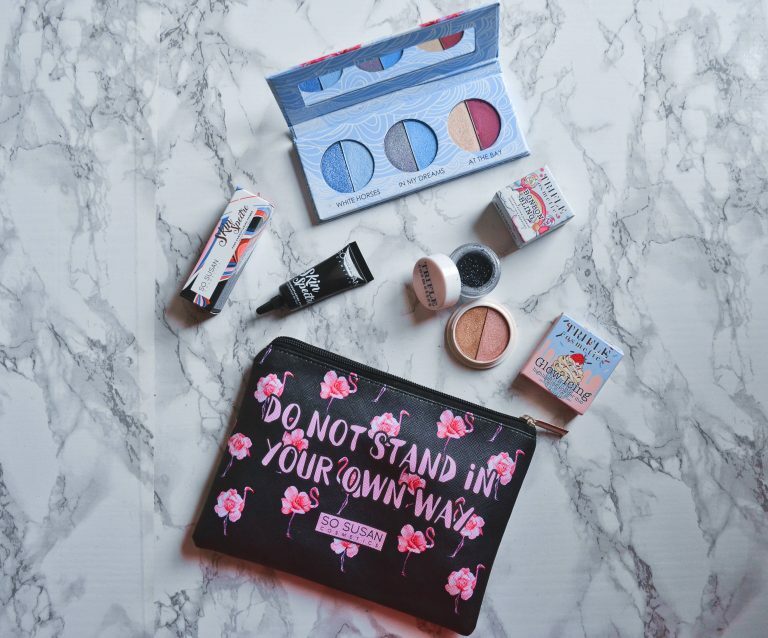 The packaging for each item is so colorful and pretty. 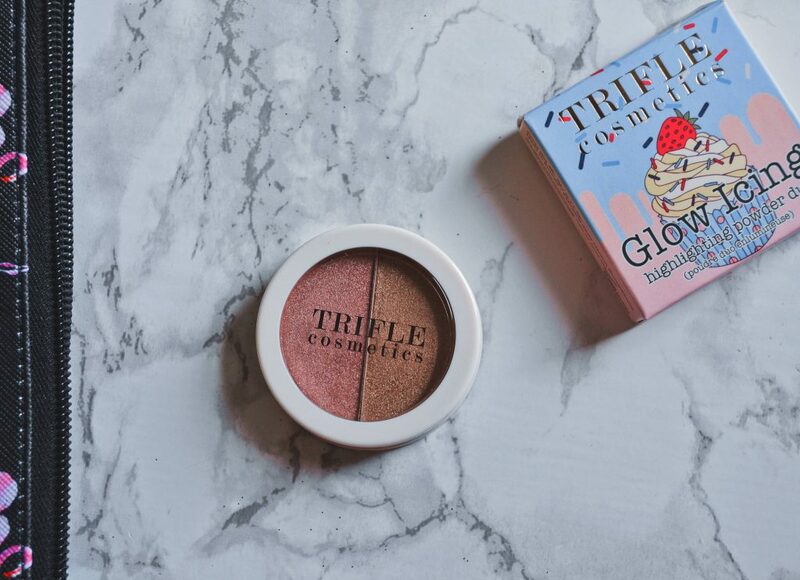 I especially love the candy-themed boxes for Trifle Cosmetics! 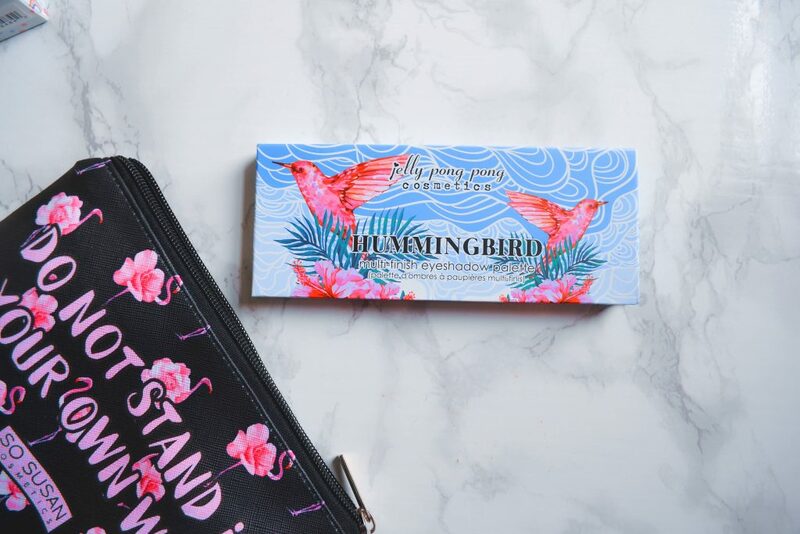 I love receiving eyeshadow palettes, so the first thing I reached for was the Hummingbird Multi-Finish Eyeshadow Palette by Jelly Pong Pong Cosmetics. 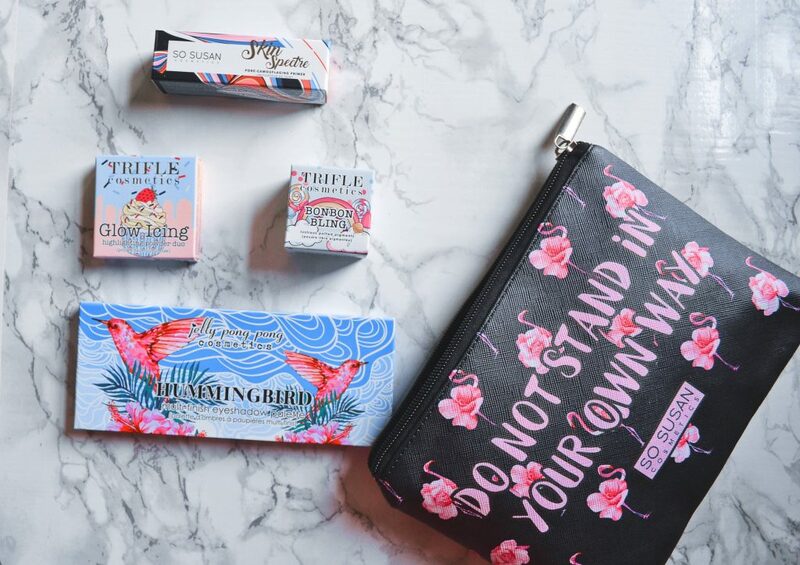 Look at how beautiful the packaging is! It has a very whimsical feel, and I love the hummingbird illustrations. 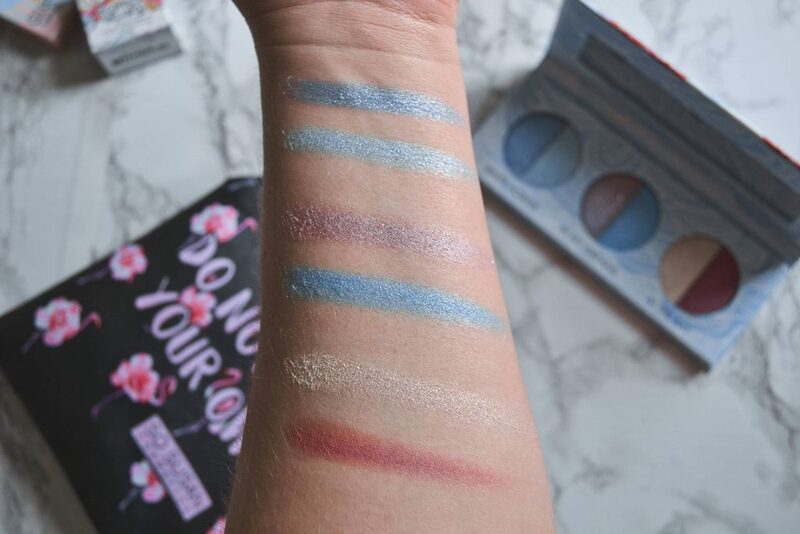 Subscribers received the palette variation “Ocean Dreams”, which is mostly cool toned blues and purples. 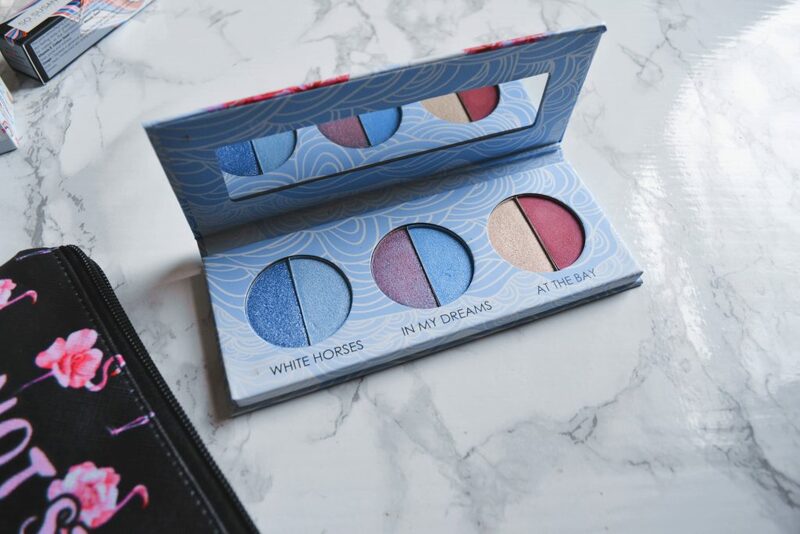 The first duo,”White Horses,” is a glittery blue that reminds me of Cinderella’s Dress, and a shimmery icy blue. 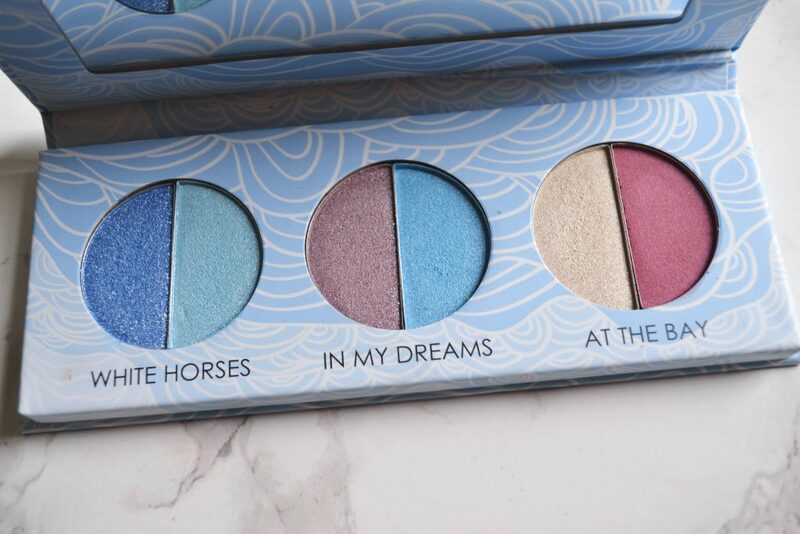 The second duo, “In My Dreams,” is a shimmery lilac with a few flecks of glitter, and another shimmery blue (which is sort of a mix between both shades from “White Horses”). The third duo “At The Bay” is a shimmery champagne and a matte burgundy. I was absolutely thrilled to receive a palette with so many shades of blue! 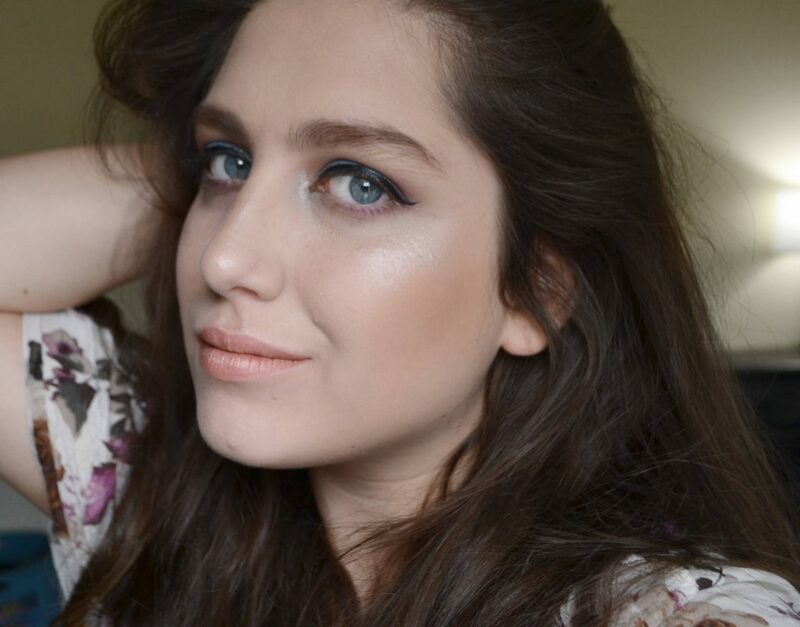 I have blue eyes, and I’ve always been told not to wear blue eyeshadow. But, I like to flaunt that rule and I actually wear blue shadow quite often. I think it is flattering, and it’s just so much fun to wear! And here are the shades swatched on my arm. As you can see, the glitter shades are kind of chunky. However, they blend easily and are beautifully pigmented! I used every single shade from the palette on my eyes today, and I quite like how it looks. I found it was easiest to apply the shadows to my eye with a finger, rather than a brush. You can actually get a much more pigmented look from these shadows, but I wanted a more subtle eye. 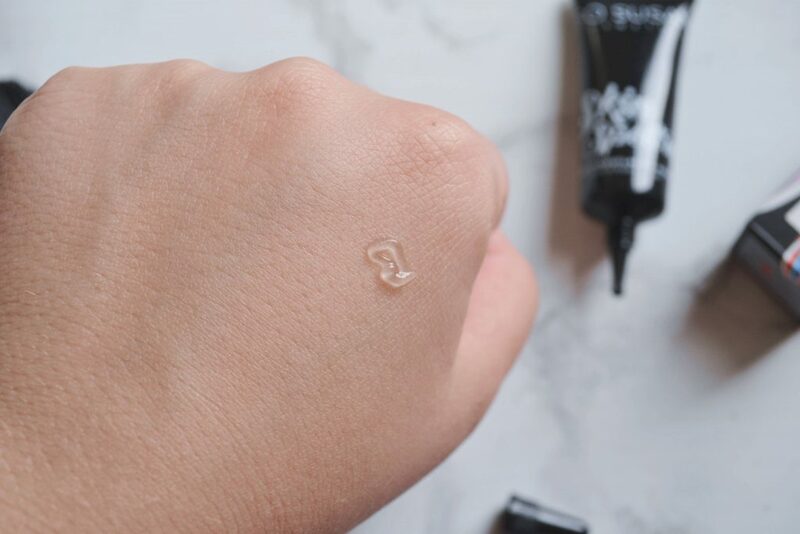 This pore-camoflauging primer has a velvety cream texture that helps hydrate your skin and create the perfect base for makeup. I’ve been using a primer that’s quite tacky, and I was astounded by the difference in Skin Spectre. It feels slick on the skin, and dries down so you can’t feel it. 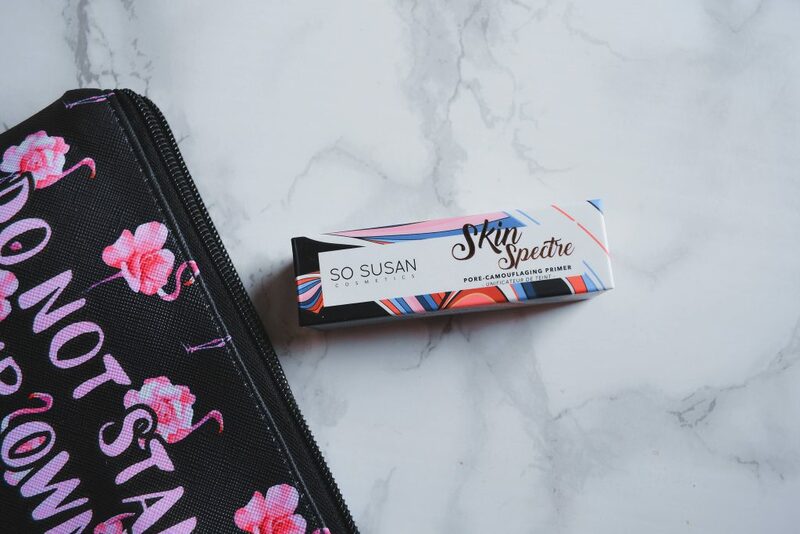 I’ve been applying it to my entire face rather than just my T-Zone (what can I say, I have big pores! ), and I’ve found that my skin looks a lot more smooth. And the primer itself comes out clear! Subscribers will receive Bonbon Bling in “Black Forest” (black), “Snowflake Muffin” (icy blue), or “Chia Pudding” (grey). 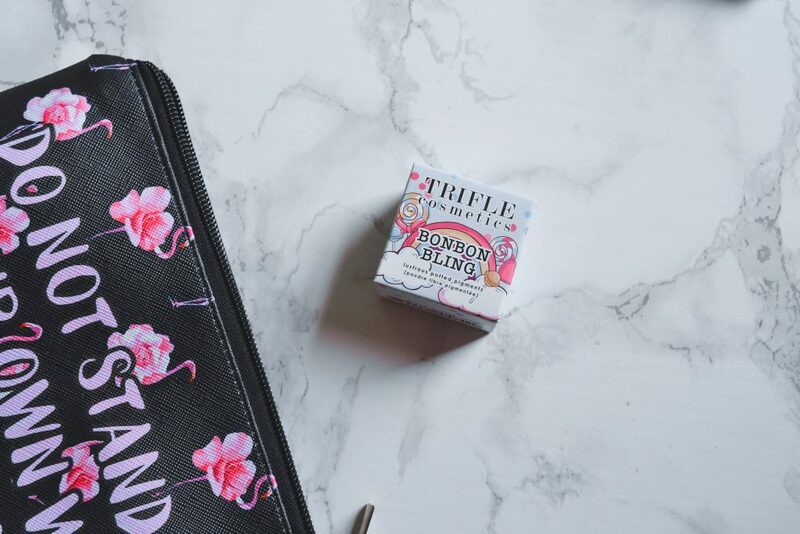 Bonbon Bling is a lustrous glitter pigment pot, which can be applied to your face, body, or hair. 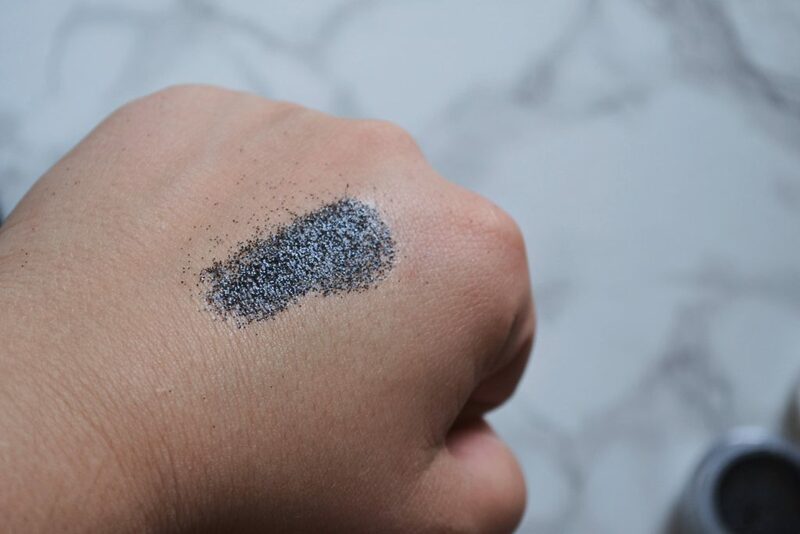 I received the shade “Black Forest”, which is a black glitter with silver reflect. I don’t think I will really use black glitter, so I will be giving this to a friend. It is a good quality product, but it is just a little too adventurous for me! I’ve applied the Bonbon Bling over my favorite glitter primer for this swatch. If you look closely, you can see the silver reflects! 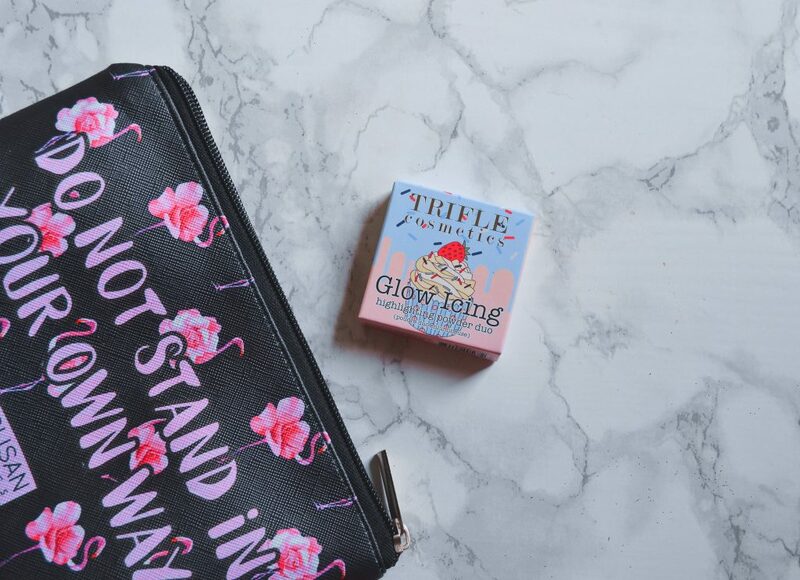 The final item subscribers will receive is “Glow Icing”, which is a highlighting powder duo. 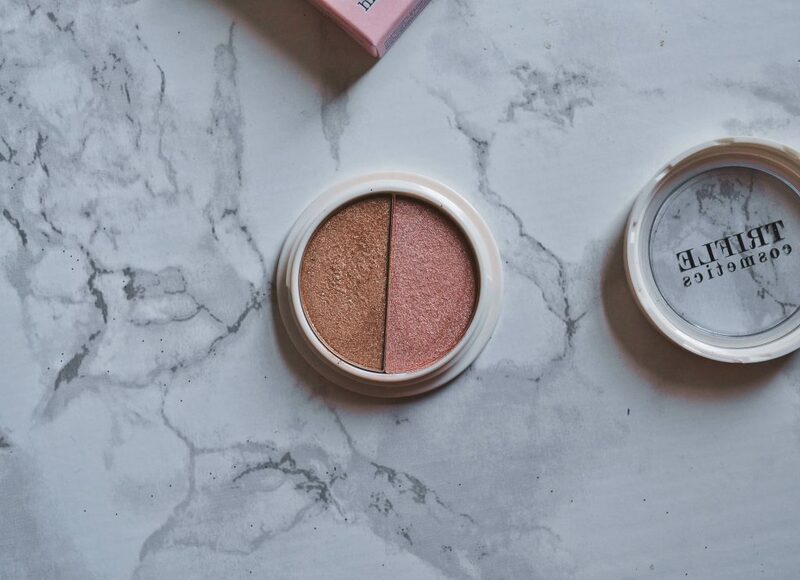 These powders actually feel quite creamy, and have an intense shine. 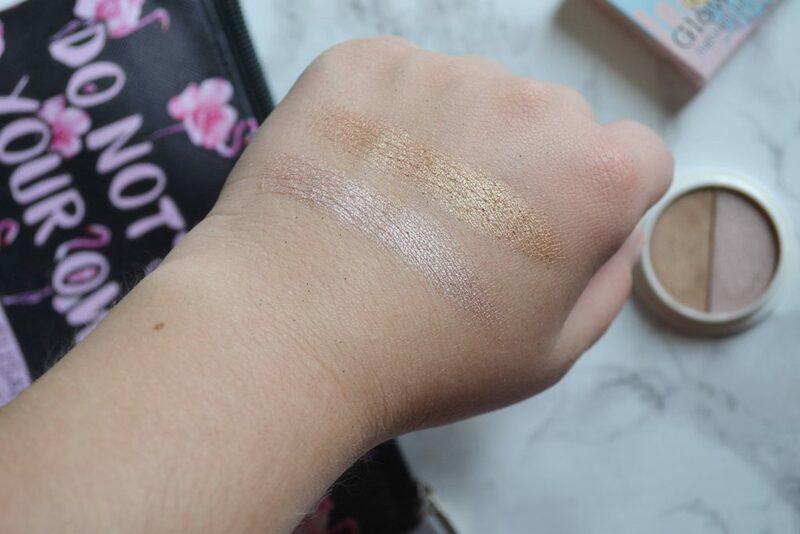 There is only one shade variation for the duo, which is a pink and golden highlight. I don’t think this will be suitable for all skin tones. The pink works well for me, but the golden is a little too dark. I think this will work best with medium skin tones. 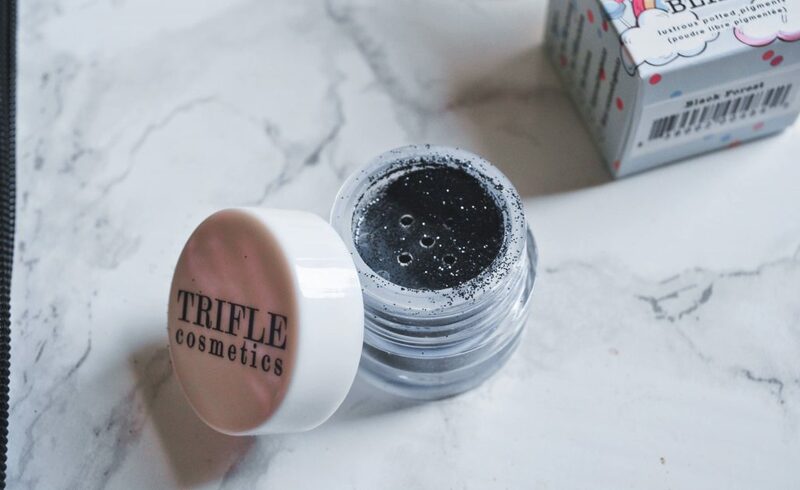 However, you can find other ways to use this product, such as in the inner corner of your eye or layered over your lipstick! I really love the packaging of this product! The box has an adorable strawberry cupcake design, and the pan itself is sleek and modern. The Glow Icing is incredibly pigmented, and looks velvety on the skin. Just look at this glow! 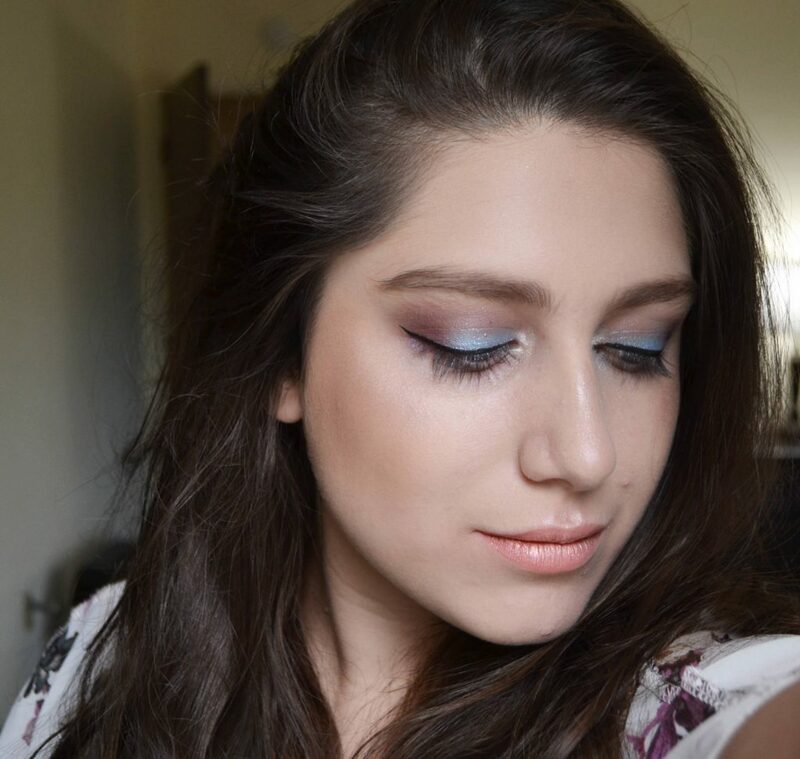 I used every product in today’s makeup look! How do you think it turned out? Overall, I enjoyed Color Curate’s September subscription. I probably won’t use the black glitter, but I am super impressed with the Hummingbird palette and the Skin Spectre. Those alone are worth more than the cost of the subscription. 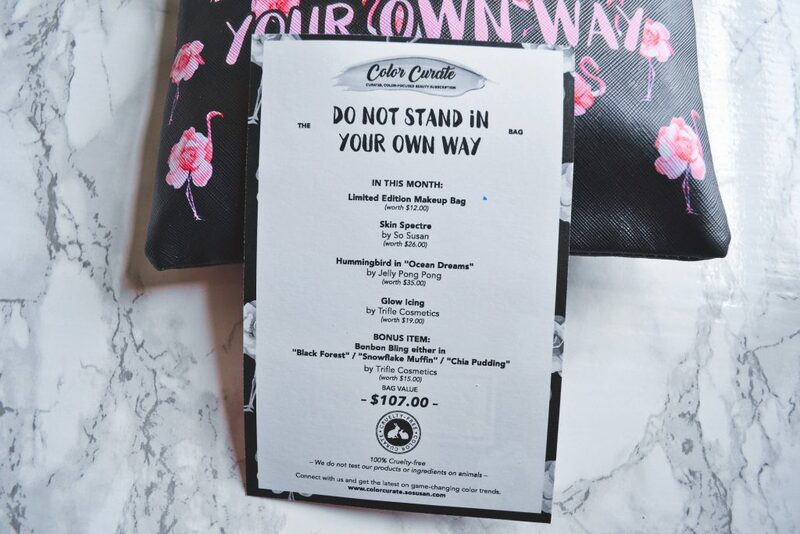 This month’s Color Curate was worth $107, which includes the limited edition makeup bag. 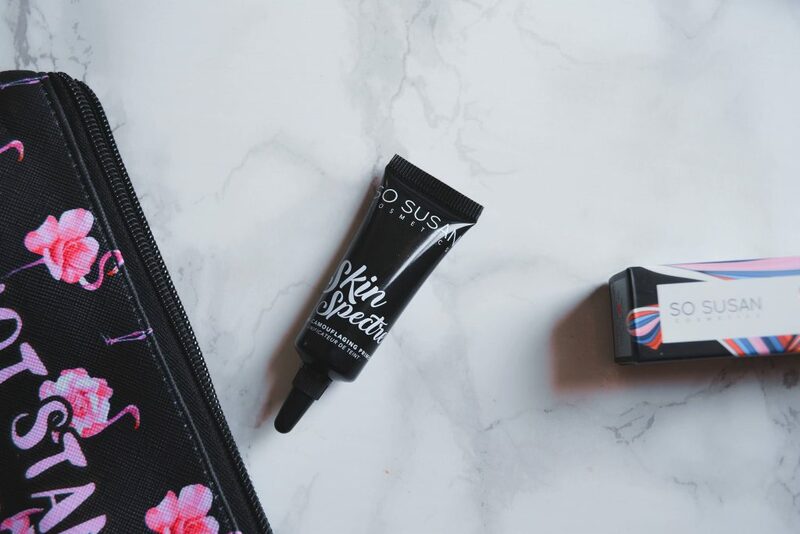 I think this is such a fun way to discover colorful, vegan and cruelty free makeup. How would you rate Color Curate ?